‘You teach me, and I’ll teach you’ goes the Pokémon theme tune, and you can see the tv series as the learning journey that the central character, Ash, makes from complete novice to Pokémon master. As ed-tech social media fills up with rapid-response pieces on what Pokémon Go could mean for education, I thought it was time to refer back to work with a more solid basis. And what could be a better starting point than our 2014 book on Augmented Education? Augmented Education explores the implications and challenges of augmented learning – learning at the frontiers of reality – and the ways in which we can understand it, structure it, develop it and employ it. It investigates what we can do now that we could not do before, and asks whether these new possibilities could fundamentally affect how people approach and benefit from learning. For example, can augmented learning create the social, affective and cognitive conditions that will allow individuals and groups of people not only to approach learning in a meaningful way, but also to engage with it more deeply? 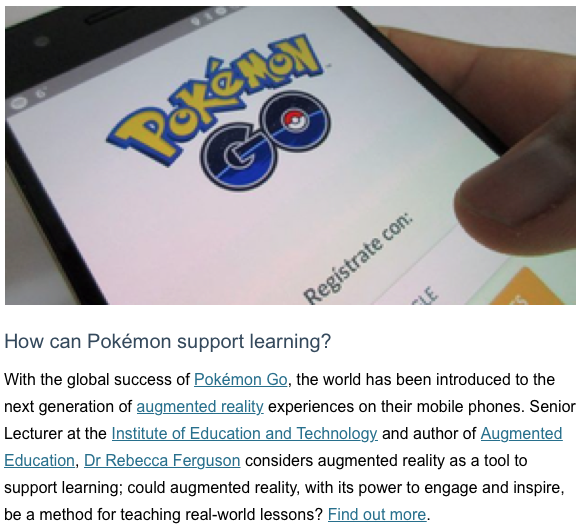 To encourage people to read the book, I wrote a piece for the OU News and OpenLearn on Pokémon Go, and how the game aligns with the four approaches to augmented education that we identify in the book. The book provides a detailed overview of the newest possibilities in education and shows how technological developments can be harnessed to support inclusive and collaborative knowledge building through formal and informal learning. In order to do this, we employ a broad definition of augmented learning. Using this definition, the book extends beyond the augmentation of teaching, learning and schools to include informal subject-based learning, learning using social media, collaborative informal learning and educating the transhuman. View a draft of Chapter 1, which introduces augmented learning and considers what augmentation can offer to education. This ScoopIt on Augmented Education pulls together a series of related links. This entry was posted on August 5, 2016, 10:49 am and is filed under Articles, Books. You can follow any responses to this entry through RSS 2.0. You can leave a response, or trackback from your own site.